Be Irish just for the day! With great music, food and drink, and fun friends, Columbus’s Irish pubs are a great place to celebrate St. Patrick’s Day! Where are the best Irish pubs in Columbus, OH? There’s nothing so welcome after a long, snowy Ohio winter as the sight of green— especially when it’s green shamrocks and green beer of Saint Patrick’s Day! But finding the best Columbus metro-area Irish pub with the best St. Patrick’s féile can involve sifting through more blarney than you’d care to shake your shillelagh at. Fortunately, we’ve collected all that information for you, whether you’re looking for a big outdoor festivals or a cozy neighborhood pub. Here’s Ohio Energy Ratings’ list of Best Columbus Irish Pubs! Fadó Irish Pub maybe part of a national chain but each one offers an awesome experience unique to its city. This year, Fadó’s in Columbus will open its doors on Saturday the 16th at 11 am to kick off its annual St Baldrick’s Foundation Head-shaving event. The St. Baldrick’s Foundation is a not-for-profit organization with the aim of raising funds to help find cures for children with cancer. On Sunday, St. Patrick’s Day, the area behind the pub hosts the party in a giant heated tent. The pub opens at Pub opens at 7 a.m. with breakfast, beer, cocktails and LOTS of Irish music through out the day until close. When you’re surround by Irish music with lots of energy, the best company in Ohio, low priced food and drink, how can you notbe happy? Flannagan’s Dublin might be best known as Columbus’s biggest volleyball bar. But each St. Patrick’s Day it pulls out the stops, featuring traditional music that’s acoustic and electric, providing Columbus with the biggest party in the area. The festivities get started on Saturday March 16th with music all day into the night. General admission at the door costs $5 fro 8 am to noon, and then climbs to $10 from noon to close. They’re also staging their annual St. Patrick’s Day 5K Run! Runners get a FREE all day pass to their St. Patrick’s Day party. Oh how could you not! Just northwest from center city Columbus lies Dublin, OH. According to local legend, practically every building in Old Dublin housed a tavern or bar at one time or another. Comparing pubs apples to apples is a little difficult because venues offer larger musical acts while smaller pubs provide a pleasant place to relax and converse. Pubs in Dublin offer smaller, intimate settings with fantastic food and charming atmosphere. “Fadó Pub and Kitchen” in Dublin is an upscale pub and restaurant featuring local sourced menu items, including brews and spirits. This year, they’re closing down Longshore Drive, setting up a big tent, and hosting a two day block party with live music, Irish dancers, Irish food, and perhaps even a little beer. Tickets are $20 for both Saturday and Sunday with both days opening at 11 am. Perhaps one of the more intimate Irish pubs in metro-Columbus is the Dublin Village Tavern. With the building is estimated to have been built in 1889, “DVT” has an excellent menu featuring popular Irish beers, whiskeys, and food like Irish Egg Rolls, Hooley Eggs, Irish Kettle Dinner, and great burgers. They pride themselves as being the place where the Dublin locals gather. If you’re looking for good company and good food away from the high energy crush, give them a visit. Just down the I-270 expressway east of Dublin is Worthington, home of the Blarney Stone Tavern. Their St. Patrick’s Day celebrations features a whole weekend of shenanigans, bands, bagpipes, and a visit from Lucky the Leprechaun. With great fare like Irish nachos, wings, burgers, Irish-themed cocktails, and over 15 beers on draught, you’ll see why this fun place made our list! 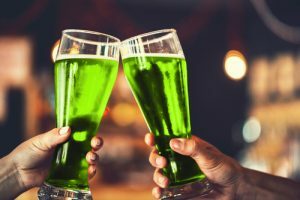 St. Patrick’s Day also heralds the beginning of the spring shoulder months when Ohio energy prices fall due to warmer weather and low demand. By shopping and comparing for the best electricity prices in Columbus right now, customers can save money all year. Check out low fixed rates plans at https://www.ohenergyratings.com today to find the best plan that fits your family’s needs! Copyright © 2019 www.ohenergyratings.com . All rights reserved.